Someone on the Catholic Discussion Forum asserted his opinion and tradition against the papacy in the Catholic Church. I gave short, imperfect, and brief comments in the ten minutes I had free today. This is a thread on whether or not the office of the papacy with qualifications for successors is mentioned in scripture. My comments are in dark blue. 1. In order for the papacy or an earthly head of the church with successors to be true as a definer and protector of truth, it would logically have to be described from the beginning of the church in the apostolic period and not as a later development. Why does this have to be true? Wouldn’t this claim then be imposed on all development of doctrine such as the canon of Scripture. In other words, for the truth of sola scriptura to be true, it would logically have to have been in existence from the first, which of course not the case. Further, in my book Upon this Rock I demonstrate quite conclusively that the concept of the Primacy of Peter in Rome was quite well understood and practiced in the early Church. By clicking on the link to my book one can also access hundreds of pages of discussion and documentation. For the very few documents that survived the first centuries, we have a very strong case for the primacy of Rome. 2. For the office of papacy to be true, it would need to be described with qualifications for successors, in the inspired writings among the gifts given by Christ for church unity when he ascended into heaven in Ephesians 4:7-16, yet the papacy is conspicuously absent. How does he know it was NOT described with qualifications. We know that the Alexandrian Library in Egypt was massively stocked with books and documents that no longer exist. We unhappily lost much of what was written and practiced in the early Church. But, even saying that, does this fellow have any documentation from the early Church to affirm a 27 writing canon from the earliest years, or the word “Trinity”? He is very free with “it would logically have to be true” when he points at us but not so freely with his own position. 3. Such a fundamentally important central role as the papacy, in order to be true, would be a central repeated theme of writings by the first Christians: Luke, James, John, Paul, and Peter himself, yet there is not a single mention. And where do we find these same men repeating the express doctrine of a New Testament canon or the clearly expressed theologies of the two natures of Christ or the three Persons in the hypostatic union of the Trinity? In fact, there are many things that are taken for granted today that were not expressly stated in the NT. Protestants live with this every day with their traditions. Reading the writers of the NT within the context makes it pretty clear about the papacy if someone takes the blinders off. By the way, none of these writers mention the Rapture, Sola Scriptura, the Trinity, faith alone, or any host of other Protestant traditions. 4. Although “head of the church” is a phrase, office, and title in scripture, only Christ and never Peter was ever referred to as such. This would of course be true in that the NT is more expressly interested in establishing who Jesus was in the documents of Scripture. One does not have to find something expressly stated in order to find it believed and universally practiced. I would suggest Dave Armstrong’s book about proofs of the Papacy from the Bible. Jesus is the head of the Mystical Church and baptized believers are the members. But the Church is not just an amorphous invisible blob or some sort of non-descript brotherhood. It is a real organization of real people in the Body of Christ. The Church has an address! We are to have a visible unity as Jesus intended, not an invisible imaginary “unity.” Jesus left a shepherd, a head of the visible church as the source of unity and teaching. This can be substantiated in the NT unless one refuses to remove the blinders. Even Protestants have their pastors who function effectively as the “head of their church” though they would quickly claim that it is actually Jesus, but in reality, in the day-to-day the pastor effectively functions as the head or CEO. 5. Peter is not explicitly identified as the head of the church in the Jerusalem council in Acts.15; rather James makes the closing summary, although even James is not identified as sole head or bishop of the Jerusalem church. James quotes Peter and the OT as the infallible source of theology on the matter. It doesn’t to say Peter was the head expressly as it was quite clear to those who attended and by the theological determination who was the head. James was the bishop of Jerusalem sitting in the chair that was vacated by Peter to become the teacher of the world as St. John Chrysostom says. Our friend makes too much of “explictely” and this can certainly and effectively be turned on him much more so than on us. His tradition falls far short if he wants to apply the same standard to himself. Too often Protestants judge Catholic practice by Protestant ideals. What happens if we judge Protestant practice by Catholic ideals? 6. Peter is never identified in scripture as the singular bishop of the Jerusalem diocese or of any diocese. Peter alone was given the keys in Matthew 16 and singularly headed the Church in the book of Acts. It seems that there was a college of bishops that worked together with one at the lead. This is very likely regarding Peter. In Scripture no one is expressly stated as bishop of Jerusalem and yet anyone who knows history knows that this is what existed and from the earliest times. 7. If there was an infallible head of the church and voice of Christ on earth with successors after Peter, there are no claims, writings, or pronouncements from them until Victor blunders onto the scene with his error, even though the period was fraught with heresies, and the entire NT was written when the apostles and church were persecuted from the beginning. Maybe our opponent has never heard of St. Clement? This guy really needs to read my book Upon this Rock which documents the primacy of Rome from the apostolic age. In another place 1 Cor. Paul writes that it is Jesus that is the foundation, and does not mention Peter or any of the apostles. Does that mean that Paul is wrong in Ephesians or 1 Corinthians 3 and that John is wrong in Revelation? We see various “foundations” in various metaphors used by NT writers. Peter is the rock in Matthew, Jesus in 1 Cor., the apostles and prophets in Ephesians, and the 12 apostles in Rev. In one metaphor Jesus is the foundation and in others it is all the apostles. But one cannot dismiss Matthew where another metaphor — the one in which Jesus is not the foundation but the builder — and in this metaphor, Peter the Rock is the foundation and is given the keys of the kingdom. If indeed Peter was the head of the church with successors as the voice of Christ and the basis of unity, where is this voice during the turbulent years of persecution and heresy before Constantine? Someone will say, “They went to their deaths as martyrs.” But so did the apostles, yet we have their writings well-preserved for us. Where are the writings of the popes from 60 AD to 325 AD? (Clement’s letter is not from him as a singular bishop but from the church of Rome to the church of Corinth, not to the singular bishop of Corinth.) We have something recorded ABOUT some of the other alleged popes but not a single written word FROM them. But correct me if I am mistaken. I would find their writings most interesting. First, 1 Clement WAS writtten by St. Clement as both Catholic and Protestants agree, and also mentioned as such by those who refer to the letter in the first centuries. Like I said, I gave pages and pages of documentation from the early Church. Just because one doesn’t read history or do their research does not mean it does not exist. I would also suggest that this friend read the Treatise on the Development of Doctrine by Cardinal Newman. The papacy can be demonstrated from the first centuries, but we also accept the concept of the development of doctrine (as must the Protestant, especially with the canon and their sola scriptura) which puts everything in its proper place. I am proud to be a Catholic rooted in Scripture and the early Church! I appreciate you putting this information up here on your blog. This topic is of great concern to me it requires much thought and meditation. I have read your book on the Papacy, and I saw how early it was that Christians began to mention seed-forms of what would become the modern day papacy. In the first place, I would agree with the poster who said that something so grounding and important as the Papacy would be mentioned from the very inception of it’s existence. To carry the claim that Jesus Christ established a special, unique, singular, perpetual, indestructible, and infallible “office” which would begin with Peter (the rock of the Church) and that would continue on in the form of a successive dynastic structure, similar to that of the kings of Israel, and that would be the visible head and Shepherd of the world-wide church until the return of Christ, and which depends not on the holiness and righteousness and faith of the person fulfilling this office, is a VERY suspicious claim to carry when one considers the early church’s history. Simply resorting to the later development of the NT canon will not do to justify as a comparison ( I will mention why a little bit below). We know that Peter was given the function as “rock” of the Church which would build, and that the “keys of the kingdom” would be given to Peter and that this would involve the functioning authority of “binding and loosing”. Such words would have made sense to Jewish hearers. What Christ was doing was giving Peter authority as a steward of God’s kingdom on earth. This is why “whatever is bound on earth will be bound in heaven”: this gap which exists between “heaven” and “earth” will be regulated by the Steward of the earth part of God’s kingdom, and such exercises of authority will have it’s settlement in heaven, ultimately, as a result. Also, this power of the keys, the function of being “rock”, and the authority of binding and loosing are not isolated endowments. Rather, Simon has been divinely inspired to know who Jesus was: The Christ of God. Peter came to know inspired and divine truth. It was Peter’s confession of the true identity of Christ that sets the stage for these figures of the “rock of the Church” and the “keys of the kingdom of God”. Truth is the circle that surrounds the situation. Nothing about succession, rather truth is the foundation to this situation where Simon is re-named and authority is granted to him. Moreover, the “church” is able to carry on the “function of the keys” in disciplinary proceedings. A person is “excommunicated” under and by the utilization of these “keys to the kingdom of heaven”. Interestingly, the “keys” are at work here in settling the issue of “offenses” in the Church. We see that it is not just “Peter” alone who can utilize the “keys” but also the “Church” – (obviously Peter is in the Church as well). But we must see that the “keys to the kingdom of heaven” are somehow wider in it’s possession than simply Peter as an individual. In fact, Peter here is representing the whole apostolic church. All this being said, we read nothing of a succession of bishops. This is something that would have been in an instructional manual or in a contextual conversation with Christ on how the Church was to continue in the world, but rather the Context of Matthew 16 is again the issue of “truth”. It was revealed to Simon who Jesus really was, and this sets the stage. An attempt to pull in Isaiah 22 into the picture here is rather weak in my opinion, for no one argued like this until Catejan in the medieval period. Finally, trying to appeal to a later development of the NT canon to try and make appropriate the later development of the Papacy is extremely faulty. In the first place, the NT Canon is not a creation or development of the Church that began with “seeds” and then eventually underwent a “watering process” and then with time undergoes a “sprouting process”, etc,etc,etc. Rather the documents of the NT Canon were already circulating and recognized as authoritative very early in the Church as is evident with Ignatius, Clement, Ireneuas, Tertullian, etc,etc….It was not really a codified doctrine, rather it was just the logical nature of submitting to apostolic teaching. For example, Paul just assumed the right to have his epistles read by more than one church “And when this letter has been read among you, have it also read in the church of the Laodiceans, and see that you also read the letter from Laodicea” (Colossians 4:16). This doesn’t take great pain to assume that this was a practice from the very start does it? Peter also recognized that Paul’s epistles were circulating (2 Peter 3:16). Now grant it, Paul most likely wrote many more epistles than we have in the Canon, for instance, there is missing the prior letter to the Corinthians and then also the Laodicean epistle (which some believe to the epistle to the Ephesians), but we really are not concerned here with “which letters get in” or “do we have all of them”, rather the issue here is “should we hold them as authoritative scripture to be submitted to?” and I think that such a conceptual question has warrant right from the get go and has evidence right in the NT documents themselves to support the logic of getting what books we know are circulating and must be read by all the faithful. Therefore, the canonization of the NT is not a doctrinal development, rather it is a principle that was put into action. This principle is inherent in any historical investigation. For instance, if we want to know what happened in a homicide event, we consult the witnesses and hear their stories. This is not a development in principle, it is just the action put into practice of a principle that is assumed and inherent to be logical from the start. It is pre-suppositional. To gather the data closest to the apostles and which were being circulated around by all the churches and to put such a collection together is just compared to me cleaning up my library collection and putting things in order so that I know exactly what I have to use. Now grant it, there were many disputes for certain letters, as to whether there was certainty of it’s apostolicity such as Revelation, James, Hebrews, and 2 Peter. But still, whether these letters went into the NT Canon or not, there really is still not development of doctrine involved here. I am really quite puzzled that you use this argument in the book as well to try and legitimize a later development of the papacy. The Papacy claims to have it’s origin with Jesus and Simon at the moment where God reveals to Simon the true identity of Jesus. That Christ here established a dynastic structure consisting in an unbroken line of succeeding bishops, uniquely, particularly, singularly, visibly, perpetually, and indestructibly beginning with Peter and which would continue on and on until the end of the age is quite missing from the text of the gospel of Matthew. And that this unique and supreme “office” works to fulfill God’s purpose despite who is in the office, whether he is bad, good, believing, or disbelieving, is something which would of had to have it’s publication right from the inception. For a serious thinker, the analogy of a seed to it’s full blow tree structure is still not working here in comparison to the modern Papacy with what went on here between Jesus and Cephas. I mean for goodness sake, Paul missed out on telling Timothy about this foundational doctrine when he was giving Timothy sincere admonition to not stray from the truth. If the Papacy and the surrounding college of Bishops were really what Christ had it mind when he said “on this rock I will build my church”, specifically the reference to the Church, then Paul simply was unaware of this foundational “rock” function of the successors of Peter, and as such we have a witness to the post-apostolicity of the Papacy. By the way, I would not hold to a doctrine of “sola scriptura”. I respect the tradition of Christianity as well as Scripture, so long as either do not contradict. Sorry for posting so many times. At the moment I feel that the Papacy of course has development, but the type of development in the Papacy is one of brand new material centuries after the beginning of it’s inception. If the apostles and their first disciples did not know about a specific office which would be a perpetual successive line from Peter onward until the 2nd coming of Christ, this would have been cherished and kept pure and taught publicly. Think of how crucial it would have been to rely on such a foundation. And yet we find the apostles and first Christians speaking about the furtherance of the gospel in much different ways. The method of comparing the development of doctrine of the papacy to the development of the NT canon is not a valid comparison. The principle of reading the writings of the apostles and considering them authoratative, or even those writings which were written by apostolic men is not a development in principle or concept. In other words, the bishops of the council were not insisting on the need for a collection of writings to be canonized and then went out looking for those writings. Rather the bishops coming from around the world all had a tradition that came up from the generation prior. You see, with something like a presidential “office” which imposes (however gently) a unilateral supreme power of almighty God over the world-wide populace of God’s people which is independent of the human being who sits in it and which would exist as the visible sign and head of Christ on earth until the end of the age, is something which requires new material constantly throughout the course of the 1st century, and then on to the 2nd century, and then on and on and on. Hi, if I may, here’s how I would respond. It is described in Scripture. ?2. For the office of papacy to be true, it would need to be described with qualifications for successors, in the inspired writings among the gifts given by Christ for church unity when he ascended into heaven in Ephesians 4:7-16, yet the papacy is conspicuously absent. John 21:17?He saith unto him the third time, Simon, son of Jonas, lovest thou me? Peter was grieved because he said unto him the third time, Lovest thou me? And he said unto him, Lord, thou knowest all things; thou knowest that I love thee. Jesus saith unto him, Feed my sheep. 1. In fact, there is. 2. But yours is a matter of opinion. I don’t see the need to repeat it since Jesus Christ already commanded it. 3. The fact is, that many things are assumed in Scripture. One of those is the primacy of St. Peter. Scripture follows the Tradition established by Jesus Christ. That is why St. Peter is so frequently mentioned first. Why he speaks with authority over the other Apostles. And why, at one point, he asserts that lying to him is tantamount to lying to the Holy Spirit (Acts 5:3). Except when Christ referred to St. Peter as the Rock on which He would build His Church. The name “Rock” is very telling. Rock is God’s name. Yet Jesus gave St. Peter that name. Signifying that St. Peter would be as God before the Church. T5. Peter is not explicitly identified as the head of the church in the Jerusalem council in Acts.15; rather James makes the closing summary, although even James is not identified as sole head or bishop of the Jerusalem church. But it is St. Peter who makes the remarks upon which the meeting is resolved. 1. No need. The New Testament is written based upon the Traditions of the Church. The Traditions are assumed in the writing and not always explicitly named. 2. Also, theological language is not yet developed at the time of the writing of the New Testament. For instance, the Trinity is yet unknown except as it it described. The Eucharist is still unnamed. And the Sacraments are not referred to as the Sacraments, but as the doctrine of Baptisms (Hebrews 6:2). 3. The New Testament was written at a time of persecution. St. Peter was in hiding. St. Peter is not mentioned as the singular Bishop of any Diocese for his safety. 4. However, Jesus names him the Bishop of the entire Church when He names him Peter and gives him the keys to heaven. It is there from the time that Jesus pronounced the words, “Upon this Rock, I will build my Church. ” You are simply living in denial. As Steve Ray has said in the past, you are mixing your metaphors. 1. It is obvious that Jesus was speaking metaphorically when He said He would build the Church on the Rock of St. Peter. The metaphor means that Jesus established St. Peter as the most important, foundational, leader of the Church. 2. However, Scripture gives us several metaphors of the foundation of the Church. b. Christ and the Prophets and the Apostles as foundation. 3. In order to understand how all these metaphors work together, we need to know how Jesus designed the Church. 4. The Church is the Body of Christ. He is the Owner. But the title, Body of Christ, gives the sense of the design. Christ designed for Himself a corporation. Complete with CEO and board of managers. And the Church has been an ongoing concern to this day. The Achilles Heal of the Papacy Theory ?If indeed Peter was the head of the church with successors as the voice of Christ and the basis of unity, where is this voice during the turbulent years of persecution and heresy before Constantine? Someone will say, “They went to their deaths as martyrs.” But so did the apostles, yet we have their writings well-preserved for us. Where are the writings of the popes from 60 AD to 325 AD? (Clement’s letter is not from him as a singular bishop but from the church of Rome to the church of Corinth, not to the singular bishop of Corinth.) We have something recorded ABOUT some of the other alleged popes but not a single written word FROM them. But correct me if I am mistaken. I would find their writings most interesting. Steve Ray corrected you already. Read the letter of St. Clement again. It is obvious that he is writing as the CEO of the Church. That means that he represents the entire Church. That is why, frequently, the Pope uses the royal “we” in his documents. Because he represents everyone in God’s Kingdom. Hi Erick, this is De Maria. It is an excellent book. I enjoyed it immensely! In the first place, I would agree with the poster who said that something so grounding and important as the Papacy would be mentioned from the very inception of it’s existence. To carry the claim that Jesus Christ established a special, unique, singular, perpetual, indestructible, and infallible “office” which would begin with Peter (the rock of the Church) and that would continue on in the form of a successive dynastic structure, similar to that of the kings of Israel, and that would be the visible head and Shepherd of the world-wide church until the return of Christ, and which depends not on the holiness and righteousness and faith of the person fulfilling this office, is a VERY suspicious claim to carry when one considers the early church’s history. You’re suspicious. I’m not. I believe in the promise of Our Lord, and the gates of hell shall not prevail against it. That is a statement of opinion. ( I will mention why a little bit below). We know that Peter was given the function as “rock” of the Church which would build, and that the “keys of the kingdom” would be given to Peter and that this would involve the functioning authority of “binding and loosing”. You just proved yourself wrong. The New Covenant is better than the Old. God made an ongoing concern in the Old. Why would Jesus establish a Covenant which would break down in one generation? Such words would have made sense to Jewish hearers. What Christ was doing was giving Peter authority as a steward of God’s kingdom on earth. Catholic Teaching. That is what it means to be Pope. This is why “whatever is bound on earth will be bound in heaven”: this gap which exists between “heaven” and “earth” will be regulated by the Steward of the earth part of God’s kingdom, and such exercises of authority will have it’s settlement in heaven, ultimately, as a result. You are arguing in favor of the Catholic doctrine. Not against it. Have I misunderstood your post? Also, this power of the keys, the function of being “rock”, and the authority of binding and loosing are not isolated endowments. Rather, Simon has been divinely inspired to know who Jesus was: The Christ of God. Peter came to know inspired and divine truth. It was Peter’s confession of the true identity of Christ that sets the stage for these figures of the “rock of the Church” and the “keys of the kingdom of God”. Truth is the circle that surrounds the situation. 1. That is what the keys signify. Succession. He will pass on the keys generation to generation. 2. The name Rock signifies that the Church is building upon him for eternity. Not just when he is alive. That is why, the Church, at the time of the Apostles was built upon the foundation of the Prophets who came before them. 3. In Acts 1, Judas place is filled. Indicating that everyone of the Apostles is holding an office which will be filled in the future, when they pass away. rather truth is the foundation to this situation where Simon is re-named and authority is granted to him. That is true. And the next person to hold the office will be building upon the legacy which St. Peter left behind. Moreover, the “church” is able to carry on the “function of the keys” in disciplinary proceedings. Absolutely. That does not negate that the keys were given to St. Peter. It simply shows that St. Peter’s office is the highest in rank. 1. Christ only gave the keys to St. Peter. Signifying that he is the Chief Officer. 2. The others have authority only when they are united to St. Peter, the holder of the keys. (obviously Peter is in the Church as well). But we must see that the “keys to the kingdom of heaven” are somehow wider in it’s possession than simply Peter as an individual. In fact, Peter here is representing the whole apostolic church. All this being said, we read nothing of a succession of bishops. Yes we do. You simply missed it. Read Acts 1 and read where St. Paul made criteria for the selection of Bishops. The Bible is not a manual. It is a compilation of the Biographies of Jesus Christ known as the Gospels. It also contains a record of the activities of the Apostles after Jesus ascended to heaven. And it contains some letters exchanged between between certain Apostles and the various Churches. However, the Bible is not a manual. Not in the Old nor the New do we find detailed instructions on how to run the Church. As for Catholics, we get that information from Tradition. or in a contextual conversation with Christ on how the Church was to continue in the world, but rather the Context of Matthew 16 is again the issue of “truth”. It was revealed to Simon who Jesus really was, and this sets the stage. An attempt to pull in Isaiah 22 into the picture here is rather weak in my opinion, for no one argued like this until Catejan in the medieval period. I doubt that is true. But even if it is, what of it? The keys logically signify authority, you said so yourself. And authority is passed down. Jesus did not establish a Church which would die in one generation. Finally, trying to appeal to a later development of the NT canon to try and make appropriate the later development of the Papacy is extremely faulty. That is your opinion. An opinion which I find very faulty. In fact, it is. It is members of the Church who wrote the books of the New Testament. that began with “seeds” and then eventually underwent a “watering process” and then with time undergoes a “sprouting process”, etc,etc,etc. That is a poor metaphor. The Church grew. The New Testament Scriptures were written by Church men who were inspired of God to first to preach and then to write down what they preached. Rather the documents of the NT Canon were already circulating and recognized as authoritative very early in the Church as is evident with Ignatius, Clement, Ireneuas, Tertullian, etc,etc…. How does that argue in your favor? These are all Catholic Bishops you have named. Members of the hierarchy of the Catholic Church. It was not really a codified doctrine, rather it was just the logical nature of submitting to apostolic teaching. Again, you’re arguing in favor of the Catholic Teaching. Your conclusions are completely illogical based upon the facts you are presenting. 1. The Bible is not codified doctrine. That is correct as I already mentioned. It is more easily classified as history. 2. Christ wanted us to submit to the Apostles, through the Church. Read Matt 18:17. It is the Church named there because the Apostles make up the Church and logically, because they would leave the Church behind and the Churcb needed to be authoritative throughout history (Matt 28:19-20). You’re still arguing against yourself. It is the Church which answered that question and acted upon it. No one else. There was not some other entity involved in the selection of the New Testament canon. and I think that such a conceptual question has warrant right from the get go and has evidence right in the NT documents themselves to support the logic of getting what books we know are circulating and must be read by all the faithful. Again, a decision made by the Church. Namely by St. Jerome when he wrote the Latin Vulgate. Therefore, the canonization of the NT is not a doctrinal development, rather it is a principle that was put into action. 1. The doctrine which was developed is the Table of Contents, the Canon, which was now established for the Bible. 2. The principle was put into action BY THE CATHOLIC CHURCH. This principle is inherent in any historical investigation. For instance, if we want to know what happened in a homicide event, we consult the witnesses and hear their stories. This is not a development in principle, it is just the action put into practice of a principle that is assumed and inherent to be logical from the start. It is pre-suppositional. To gather the data closest to the apostles and which were being circulated around by all the churches and to put such a collection together is just compared to me cleaning up my library collection and putting things in order so that I know exactly what I have to use. In that metaphor, you represent the Catholic Church. The Catholic Church put things in order in her library collection. A collection of books, which she had written. The papacy did not develop, it was established by Jesus Christ. The Canon developed as the Church wrote the different books and then sifted through and identified which books were authentic and which were not. The Papacy claims to have it’s origin with Jesus and Simon at the moment where God reveals to Simon the true identity of Jesus. That Christ here established a dynastic structure consisting in an unbroken line of succeeding bishops, uniquely, particularly, singularly, visibly, perpetually, and indestructibly beginning with Peter and which would continue on and on until the end of the age is quite missing from the text of the gospel of Matthew. For you, because your judgement is colored by the tradition of men which you follow. But we follow the Tradition of Jesus Christ which is there recorded in the Scripture. And that this unique and supreme “office” works to fulfill God’s purpose despite who is in the office, whether he is bad, good, believing, or disbelieving, is something which would of had to have it’s publication right from the inception. Yep. We have faith in God. You consider yourself a serious thinker, I suppose. But I also consider myself a serious thinker. And I disagree with your opinion. You mean the on that Our Lord Jesus Christ proclaimed? here in comparison to the modern Papacy with what went on here between Jesus and Cephas. I mean for goodness sake, Paul missed out on telling Timothy about this foundational doctrine when he was giving Timothy sincere admonition to not stray from the truth. I’m sure if St. Paul missed it, the other Apostles would have reminded him. The letters which St. Paul wrote, none of them were all inclusive of every doctrine of the Church. Do you see any mention of the Eucharist in 1 and 2 Timothy? And the Eucharist is the source and summit of our faith. Funny that He used the singular pronoun then. specifically the reference to the Church, then Paul simply was unaware of this foundational “rock” function of the successors of Peter, and as such we have a witness to the post-apostolicity of the Papacy. St. Paul was aware of it, although it is obvious that he chafed at it sometimes. But then, he was a work in progress. I’m certain, in the end, he submitted wholeheartedly to the authority of the Church which Christ built. I am actually an Anglo-Catholic. I admire the historical tradition of Catholicism (roman). I deny sola-scriptura and sola fide. At this point, Anglicans accept the “church tradition” as well as “scripture”, and these two are one and cannot contradict each other. At the moment, I cannot with good conscience say the modern Papacy is an outgrowth of the government of the Church in the first 5 centuries. I would say Roman Catholicism has carried well the tradition of the early fathers but has also added many things unfounded. I can only say this with honesty. The canonization is not a development of doctrine, it is simply like a police department codifying it’s regulations and procedure, but these laws have always been practiced from the start of the department. The Papacy simply does not parallel this, in anyway. Concerning Matthew 16. Let’s just consider this logically. If the following axioms are true, then there is no conceptual development of the papacy. It is interesting that when people who look for evidence of the papacy in the first 5 centuries must confess a “development” because the earliest fathers do not support a concept of the papacy, but give small elemental reference to church authority, etc,etc. 1) The “rock” function of Peter is an “office”, filled by Peter here but ultimately distinct from himself as a moral human being, outlives the life of Peter and is filled in by successors to that “office”. 2) This specific and singular “office” is indestructible, perpetual, and will always channel the Shepherding of Christ from the beginning of Peter’s bishopric until the last Bishop who will witness the coming of the Lord. If these axioms are true, then all the essential elements of the Papacy are spoken by Jesus right here. I would admit this. However, if that is true, then there should really be no confusion as to how the Church should go henceforth into the world. The apostles carry offices which are perpetual as a college, with Peter as the head and chief, and the “office” itself, not the humans inside it, are what the “faithful” are to keep their hope in for the true construction of the holy Church. The apostles would have understood this right at the moment from which Jesus spoke this. My question is, why did no one else know this? Ignatius did not know this. The epistle of Clement does not really solve or explicate anything definitive. Tertullian especially does not know of it. Tertullian is especially of importance in this matter. For he himself is the one who tells us how to understand the Christian faith. He explicitly denies sola scripture, and says that the only way to know apostolic truth is to be in succession with the apostolic churches wherein lies the deposit of the apostles themselves. He does not mention anything with regard to a papacy. He does exalt rome, but does not give the doctrine of perpetual infallibility. Is it possible that the other “offices” of the church do not retain this “infallible” charateristic? And if not, then all Jesus had in mind when he said “on this rock I will build my Church” is really the papacy and all who are united to it. If this is all true and good to you, I am glad I am still on a journey. Your comments on the Early Church and the Papacy are completely incorrect. Read my book ” Upon this Rock: Peter and the Primacy of Rome in Scripture and the Early Church” to see just how wrong you are. Thanks however, for your irenic attitude and heartfelt comments. Also the appointment of Judassi successoris just one chair not millions. Again with all respect, your assumptions are huge presumptions. The Fathers of the Church and the early Church never denied the primacy of Peter and all of them respected and lived in light of Peter’s primacy. Again, get my book Upon this Rock which documents this conclusively. For St John Chrysostom’s position you may want to read my article about it here: https://www.catholicconvert.com/documents/Webster11Chrysostom2.pdf. Thank you . Will read. Any doctrine which contradicts the doctrines of the Catholic Church, including yours, also contradicts Scripture. I am actually an Anglo-Catholic. The word Catholic, carries no magic. You are Catholic if you submit to and obey the Magisterium of the Catholic Church, the Pope and the Bishops united with him. If not, then the title bears no real meaning. I admire the historical tradition of Catholicism (roman). It takes more than admiration. It takes love and obedience. Because the Traditions of the Catholic Church are the Word of Jesus Christ. I deny sola-scriptura and sola fide. As you should. Both of those doctrines blatantly contradict the Scriptures. At this point, Anglicans accept the “church tradition” as well as “scripture”, and these two are one and cannot contradict each other. If you accepted Church Tradition, you would be a Catholic in communion with the Pope. You do not accept Tradition. You accept certain man made doctrines which resemble the Traditions of the Catholic Church. At the moment, I cannot with good conscience say the modern Papacy is an outgrowth of the government of the Church in the first 5 centuries. I would say Roman Catholicism has carried well the tradition of the early fathers but has also added many things unfounded. I can only say this with honesty. I appreciate your honesty. I am also being honest when I say that you are in error. The Catholic Church is the Church which Christ established and there is no other. 1. You have argue against yourself yet again. The Catholic Church is the police department which codified it’s regulations and procedures when it canonized the Scriptures. 2. The laws which have always been practiced are the Traditions of the Catholic Church which is the Deposit of Faith which Jesus Christ commanded the Church to teach. 3. And yes, they have always been taught. Including the primacy of Peter and the succession of the Bishops. 4. The Papacy is an Office established by Jesus Christ. Concerning Matthew 16. Let’s just consider this logically. If the following axioms are true, then there is no conceptual development of the papacy. First, considering this logically, there is no development of the Papacy. Jesus Christ established it. Period. It is an office that has always existed in the Church of Christ. Second, considering it logically, there are elements of development in every aspect of the Church. Doctrinally and Traditionally. It is inescapable. The Church is not the same today as the one which sprouted with 5000 members when Jesus Christ planted the seed. Nothing could be clearer. Jesus Christ appointed Simon the Shepherd over His Flock, the Pastor of His Church. but give small elemental reference to church authority, etc,etc. You simply don’t give enough weight to the verses which say that the Church has complete authority over its members. Authority to punish, expel and condemn to eternal punishment. Why? There are many thing which the Apostles didn’t understand. Possibly the most important of which, is that Jesus had to suffer and die in order for the world to be saved. So, it doesn’t follow that the Apostles had to understand anything the moment it was spoken. But they understood everything when the Holy Spirit opened their minds and hearts at the Pentecost. You are making sweeping assumptions. The fact they perhaps didn’t mention it, does not mean they didn’t believe it or accept it. Exalting Rome is enough. Tertullian does not deny the infallibility of the Pope. If that infallibility were challenged, he would certainly have defended it. Is it possible that the other “offices” of the church do not retain this “infallible” charateristic? It is proven historicallty. Every other office has fallen to heresy, except the Papacy. And if not, then all Jesus had in mind when he said “on this rock I will build my Church” is really the papacy and all who are united to it.And that is proven by history. All who are united to the Papacy are building their home on the rock and will not fall. You are glad now. But you won’t be in the end. The Catholic Church is the house of God. Matthew 16 would be the foundation text which everyone would have known to be the founding of dthe Petrine dynasty. It is the foundational text which Christians have always recognized. But we have no such instruction in the NT nor do we have such instructions from some of the early church fathers. 1. The New Testament is not a manual. You said so yourself. 2. We have plenty of instructions from the Church Fathers. You simply don’t recognize it because you deny the Traditions. Notice the interpretations of Matthew 16 in St. John Chrysostom and St. Augustine. To expouse the view that the rock is anfunctional office perpetual into the end would have to be unanimous in catechetical lectures to the newly baptized. The Fathers speak unanimously in the documents of the Ecumenical Councils. Outside the councils, the Fathers are not unanimous on any doctrine. Again, you are not speaking logically. If they didn’t write about it, the only conclusion you can draw is that they didn’t write about it. To jump to the conclusion that they didn’t know about it is a non sequitur. It was the first that needed to be filled. Millions would follow. Why didn’t the apostles appoint more than 12 then at the appointment of Judas? There were plenty of people to choose from. And if there are “offices” for the apostles, such like the Petrine Papacy, why is it that the other 11 do not have a single person sitting in it like the petrine succession? In other words, can it be said that there really is 12 perpetual offices when Peter’s is the only one that can be filled by one person whereas the others can be filled by millions? And even if so, why not extend this right to many others in the book of Acts? There were 3,000 on the day of pentecost. There was about 120 who went in and out among the disciples with Jesus and saw him eat and saw him raised from the dead, why were none of these selected as bishops? Only 12? Cmon, the middle east is much bigger than that. No, I think that if Catholicism were true, all 120 (or most) disciples would have become bishops right there on the spot, for all met the qualifications. And you might say, “Well the apostles were not dead yet! Therefore, there was only need for 1 since the apostolic college is only 12! !” and yet I say to you that it did not remain 12, and why not? We simply do not have 12 men succeeding perfectly from that point onward, such would be the construction if all these things were true as you say. It is only logical to say that if there is an “office” which belongs to only 12 men, and that others would fill this “office” 1 by 1, then there would be a 12 man succession, at least in the beginning. Or are you saying the other 11 apostles went apostate in the beginning? And only Peter and Clement were right? In addition, if Matthew 16 was the foundational text which grounds the installation of the Petrine dynasty, why was this not common knowledge? It simply was not common knowledge. You say that the disciples did not have to understand anything that Jesus said? And that only afterward when their hearts and minds were illuminated by the Holy Spirit would they be able to understand? Well, that would go against what Steve Ray said. According to him, any Jew who heard this issue of “rock” , “keys of the kingdom”, and “binding and loosing”, and the “gates of hell” would have Immediately thought in connection to Isaiah 22 and the idea of succession. Why would the disciples simply not know this? Moreover, Catholic apologists go to great lengths to demonstrate Peter’s leadership in the book of Acts as a proof that Peter is the first pope. But I ask, if no one knew about this, how could they have acted in this way? In other words, was Peter’s leadership an arbitrary selection from the 12 or did they all know unanimously that Peter was in charge? If they knew, then they understood this Matthew 16 text. Therefore, your argument that the disciples did not need to understand what Jesus was saying (either right away or early on from the point). And as I was saying earlier, if the apostles knew that Jesus founded a dynastic leadership of the Church in Rome, why did some of the early church fathers not attribute the superiority to Rome by Peter alone, but also Paul? Also, with respect to the end time judgement, which I think you were alluding to when you said “You might be glad now, but you will not be in the end”, (which I thought by the way was rude and a sectarian pop-shot that you only find in the cults) God is going to judge us according to our works. Jesus is returning to collect only a pure bride, those who practiced righteousness. People who did not deny themselves and pick up their cross and lose their lives for the sake of Christ and his gospel are the only ones who will merit eternal lives. In other words, those who bore the marks of the Spirit, righteousness, joy, gentleness, peace, love, patience, longsuffering, kindness, and who abstained from the works of the flesh: greed, selfishness, anger, malice, loss of self-control, sexual immorality. There are many protestants out there that shine with the works of righteousness that you cannot deny that Christ was born and nurtured inside of them. In fact, I was born and raised Roman Catholic and I never even met a true disciple of Jesus until I met other christians from other denominations. I have met a few Catholics who really love Christ (by obedience and the expression thereof), so I am not saying all Catholics do not obey, but it is hard to find; it is sad to say. Also, one last thing. I am wondering how you would respond to the protestant argument of John 3. Jesus said we do not know where the Spirit comes from and where it is going, but we only see the effects of the Spirit. It would seem that the Papacy directs the Spirit and tells the Spirit where to go and where it can work. Why didn’t the apostles appoint more than 12 then at the appointment of Judas? They didn’t need any more. There were plenty of people to choose from. And many were considered. But only one was chosen because that is all they needed at the time. And if there are “offices” for the apostles, such like the Petrine Papacy, why is it that the other 11 do not have a single person sitting in it like the petrine succession? 1. Because St. Peter is the only one to whom it was promised (Matt 16:18-19). 2. The other 11 also have successors. But that number has grown as the Church has grown. In other words, can it be said that there really is 12 perpetual offices when Peter’s is the only one that can be filled by one person whereas the others can be filled by millions? 2. But the twelve, including St. Peter, appointed many other Bishopricks in the Church as the Church grew. And even if so, why not extend this right to many others in the book of Acts? There were 3,000 on the day of pentecost. There was about 120 who went in and out among the disciples with Jesus and saw him eat and saw him raised from the dead, why were none of these selected as bishops? Who said they weren’t? If you read the lives of the Saints, you will find amongst them some who walked with the disciples and with Jesus, and they were appointed officers of the Church in various positions. Only 12? Cmon, the middle east is much bigger than that. C’mon what? Did they remain 12? No, I think that if Catholicism were true, all 120 (or most) disciples would have become bishops right there on the spot, for all met the qualifications. Catholicism is true. And there was no need for 120 Bishops at that time. And you might say, “Well the apostles were not dead yet! Therefore, there was only need for 1 since the apostolic college is only 12! !” and yet I say to you that it did not remain 12, and why not? We simply do not have 12 men succeeding perfectly from that point onward, such would be the construction if all these things were true as you say. 1. All those things are true. 2. You don’t know whether there are twelve offices which still exist. The only one we follow is the Roman See. But it is quite possible that other Sees maintain their own histories back to the Apostles. It is only logical to say that if there is an “office” which belongs to only 12 men, and that others would fill this “office” 1 by 1, then there would be a 12 man succession, at least in the beginning. Why? From the beginning, Jesus commanded the Church to make disciples of the world. Therefore, they knew that they needed to appoint Bishops as necessary. Or are you saying the other 11 apostles went apostate in the beginning? What gives you that idea? It sounds as though you are making a straw man that you can knock down. I never said such a thing. And only Peter and Clement were right? 1. Sts. Peter and Clement did not write in a vacuum. Do you find anyone who disputes their authority in the Church? 2. Or are you being cynical about the doctrine of Papal infallibility? The fact is that the Papal See has not fallen into heresy at any point in history. Whereas, many others, have. It was common knowledge and it permeates the Scriptures. You say that the disciples did not have to understand anything that Jesus said? And that only afterward when their hearts and minds were illuminated by the Holy Spirit would they be able to understand? 2. But that doesn’t mean that they did not understand anything at all which He taught. 3. So, obviously, you are making a straw man argument which you can knock down. But you are not making this argument in good faith. Well, that would go against what Steve Ray said. 1. If you were arguing logically, it might. 2. If that argument were in good faith, it might. 3. But it is obvious that you either misunderstand the Scripture concerning that how much the Apostles understood or you are arguing in bad faith. Therefore there is no challenge to Steve Ray’s explanation there. According to him, any Jew who heard this issue of “rock” , “keys of the kingdom”, and “binding and loosing”, and the “gates of hell” would have Immediately thought in connection to Isaiah 22 and the idea of succession. Obviously, that would be counted as hyperbole. Obviously, there were probably many Jews who would not make the connection. But certainly the educated Jews, would. Why would the disciples simply not know this? Who said that they didn’t? Read what I said with understanding. You are reading my words with the intent of twisting them. Moreover, Catholic apologists go to great lengths to demonstrate Peter’s leadership in the book of Acts as a proof that Peter is the first pope. But I ask, if no one knew about this, how could they have acted in this way? Hm? You just answered your own question. They did know, therefore they acted in that way. More importantly, God inspired St. Peter to speak out on behalf of the Church in order to show YOU and all who read the Scriptures whom He had appointed. In other words, was Peter’s leadership an arbitrary selection from the 12 or did they all know unanimously that Peter was in charge? 1. Christ appointed him before all of them. They were all present when Christ appointed him the Rock. 2. They were all present when He appointed him the Shepherd of the Church. 3. They were all present when the Holy Spirit inspired him to speak for the Church. If they knew, then they understood this Matthew 16 text. Therefore, your argument that the disciples did not need to understand what Jesus was saying (either right away or early on from the point). I’m not sure what you just said, but it almost sounds like you validated what I said. Yes, therefore, my argument is proven true. The building of the Church has always been appointed to Sts. Peter and Paul in Rome. It is a fulfillment of the pagan myth. We even have a feastday for Sts. Peter and Paul commemorating the fact that they both built the Church in Rome. But St. Peter remains the Rock upon which Christ built the Church. Just giving you the facts. You might be glad to be outside the Church of God now, but you won’t be in the end. Do you believe that doctrine is important? Or not? Read the Scripture. God is going to judge us according to our works. You pass yourself off as a master, but you are teaching false doctrine. No, you won’t be glad then. Jesus is returning to collect only a pure bride, those who practiced righteousness. People who did not deny themselves and pick up their cross and lose their lives for the sake of Christ and his gospel are the only ones who will merit eternal lives. In other words, those who bore the marks of the Spirit, righteousness, joy, gentleness, peace, love, patience, longsuffering, kindness, and who abstained from the works of the flesh: greed, selfishness, anger, malice, loss of self-control, sexual immorality. There are many protestants out there that shine with the works of righteousness that you cannot deny that Christ was born and nurtured inside of them. Never did. But they won’t be saved by faith alone. They will stand before the judgment seat of Christ like all the rest of us. In fact, I was born and raised Roman Catholic and I never even met a true disciple of Jesus until I met other christians from other denominations. Can you read men’s hearts? I have met a few Catholics who really love Christ (by obedience and the expression thereof), so I am not saying all Catholics do not obey, but it is hard to find; it is sad to say. God is our Judge. Not you nor any Protestant. We don’t work to please you. Nor to say what you want us to say. Jesus was speaking of Baptism. There is one Baptism. The Baptism of the Holy Spirit. But Jesus tied that Baptism of the Holy Spirit to water when He said, “you must be born of water and spirit.” But then He said, “the Spirit blows where it will”. Meaning that God is not bound by His Sacraments. An example is St. Cornelius. God showed St. Peter that St. Cornelius was already justified by the Baptism of the Spirit. Therefore, St. Peter did not withhold water. What does all of that mean to us, Catholics? 1. Baptism is an outpouring of the Holy Spirit. 2. It is also a washing of water. 3. Jesus tied the Baptism of the Holy Spirit to the washing of water in the Sacrament. Therefore, we are justified in Baptism. 4. However, God is the Judge of all mankind, He can justify whomever He finds righteous, whenever He wants to do so. Does this confirm the doctrine of the Protestants? By no means. The Protestants claim to be saved by faith alone and claim to know they are saved. But they will be judged by their faith and works at the judgment, just as we all shall. Does this nullify the Sacrament of Baptism? By no means. Because the individual, unless he has a special revelation by God, does not know he is justified by the Holy Spirit. Nor does babbling in tongues guarantee that such a justification has taken place. You said that I will not be glad to be outside of the Roman Catholic Church in the end. Were you not implying that this is going to be me? Since you cite Galatians 1:8-9, I would assume with good reason that you are calling me a false teacher, and therefore under the anathema of God pronounced by Paul. Basically you are saying that myself, and all Anglo-Catholic Clergy are going to hell because they preach a false gospel because the do not submit to the leadership of Peter. This is a grace pronouncement. Also, if you are saying that in the end you will not be happy to be in the Catholic Church, understood as the “elect” of God, the ultimate community which will inherit heaven kind of Catholic Church, then of course I would not be happy. But this is the true Catholic Church, the resurrected community which is glorified in heaven. Thirdly, you said “Can you see men’s hearts”? because I judge very little fruit from the Roman Catholic Church. This is actually a false argument to combat a righteous work. Jesus taught us that YOU will KNOW THEM by their FRUITS. In other words, their lifestyle. We really do not need to perfectly read men’s hearts to be able to discern if they have been planted by God or not. Every plant which God plants bears good fruit. St. Paul told the Corinthians Church to judge the saints inside the Church (1 Corinthians 5-6). A man who is in a fornicating relationship was immediately excommunicated and turned over to Satan for the destruction of the flesh. Paul taught that a little “leaven, leavens the whole lump” therefore to purge out the evil person from among the fellowship of the saints. Somehow, there is a judging authority that is invested in the Church that must be exercised, not just for the well-doing of the Church, but for it’s very life and state in salvation. Something that any Church historian recognizes is that the methods of ministry in Rome back in the 200’s and 300’s onto the 7th century were much much different than today. The Church did not have an open door policy for anyone and everybody. If you were among the faithful, you were examined to see if you lived in the commands of Christ. If you were not living in the commands of Christ, you were brought under discipline, and eventually excommunicated, and then only restored after a very rigorous and long road of penitential discipline. You could not just be a “christian” and on with your life. The Church was a strict order back in the day, and has become very lax in it’s discipline and has employed very simple ways of penance that allows many heard-hearted slaves of sin to be absolved from sin. If you read the accounts of the early church and it’s fathers, you will see there were many discussions about penitential discipline. I am not the only one who wants to judge the outside cover of the book, your own fathers were very excellent (and rightly so) to do so. Fourthly, you are not understanding my argument in respect to the disciples’ understanding of Matthew 16. According to you, Jesus’ statement “You are Peter, and on this Rock I will build my Church and the gates of hell will not prevail against it. And I will give you the keys to the kingdom of heaven and whatever you bind on earth shall be bound in heaven” does not necessarily have to be understood by the apostles in their life, is that right or wrong? It seems you implied this. However, it is very clear that the early church did not understand this text to be the foundation text which founded the dynastic petrine papacy. Read Augustine, St. John Chrysostom, Tertullian, and others who cite this text and give another meaning to them! You are simply passing over this tremendous whole in the argument for a Christic establishment of the Papacy. St. John Chrysostom was a Bishop, and he also brought many many people through the process of the catechumenate, the course of baptism, and the laying on of hands. St. John Chrysostom himself went through much training in his life and was a professional catechist. And he does not know that Matthew 16 is the famous foundation for the construction of the very Church that he had been bringing people into for years? Tertullian himself was a scholar and studied in Rome. If he was a catechist (there is no doubt he was catechized), he was unaware of such a supposed famous and unanimous understanding of Matthew 16 carrying the foundation for the very singular and unique founding of the dynastic papacy. Something so foundational and essential to the life of the Church passed right over the head of Tertullian and many of the people who discipled him and whom he associated with. It is from Tertuliian that the Orthodox, Catholics, and Anglicans get their support to deny Sola-Scriptura and rely on tradition. And yet Tertullian is under no influence of a papal tradition that was unanimously understood in the 1 and 2nd century. This would be like being a heart surgeon and not being aware that blood is pumped from it. It gets me very puzzled how Catholics can overlook such a huge whole in their arguments just from the life of Tertullian himself and his ignorance to the tradition of a papacy, or a roman succession as the singular means of God to build the Church. This would be like being a lawyer and not understanding the concept of law. It remains to be that if Jesus really did mean to tell Peter that he was the first in an office which would be uniquely perpetuated in the form of a succession (1 by 1) throughout all of the rest of human history, then this should have been essential, fundamental, and insistent right in the very instructions to all christians and catechumens from the very beginning, and what the historian finds when he studies the 1st and 2nd century is not this, not even a unanimous teaching in the 3rd and 4th century. I am sorry, the very concept of the “papacy” was developed, not just the later organization and production. And this fact alone leaves the thinking person concerned about the immense claims of the modern day Papacy. In addition, the historian cannot but help to notice the difference in worship from the first 5 centuries to the modern marian devotion which takes place in the RCC. This is also concerning and would be for any God honoring Christian who maintains a Jewish view of Yahweh, who is the same God who brought up Mount Sinai with Israel and is the same God who now exalted His Son as the head of the Church. I causes me to re-think bowing down on my knees before the shrines of Mary and giving up my whole life to serve her, which many Catholics have done with conviction and confession. You said that I will not be glad to be outside of the Roman Catholic Church in the end. Absolutely. You will not be glad to be outside the Catholic Church in the end. Were you not implying that this is going to be me? Did you not say you were glad not to be in the Catholic Church? What were you implying? and therefore under the anathema of God pronounced by Paul. Basically you are saying that myself, and all Anglo-Catholic Clergy are going to hell because they preach a false gospel because the do not submit to the leadership of Peter. If you don’t repent. I would say that is the teaching of Scripture. What do you think? Does Scripture say you are free to teach whatever you want? This is a grace pronouncement. I am in the Catholic Church and quite happy to be here. I don’t know where you got that twist. I said that those who are outside the Catholic Church, will not be happy in the end. understood as the “elect” of God, the ultimate community which will inherit heaven kind of Catholic Church, then of course I would not be happy. But this is the true Catholic Church, the resurrected community which is glorified in heaven. I’m not sure what you are trying to say in that last part. I understood you to say you were happy to remain outside the Church. Sounds like you are now changing it. That is illogical. You are mixing subjects. But you are wrong on both counts. 1. The fruits of the Catholic Church are too numerous to list. If you haven’t seen any, you haven’t been paying attention. a. The Catholic Church is the largest Christian Church in the world. Preaching Christ throughout the world and throughout the centuries. b. She put the Bible together. c. She wrote the New Testament. d. She is the largest charity institution in the world. Has more schools, more hospitals, and gives more to the poor than anyone else and has done so for a longer time than anyone else. e. She produces more saints than anyone else and of a higher quality. [quote]Jesus taught us that YOU will KNOW THEM by their FRUITS. That is true. The Catholic Church has produced more good fruits than any other institution that ever existed on this earth. In other words, their lifestyle. We really do not need to perfectly read men’s hearts to be able to discern if they have been planted by God or not. You judge by the outside. God reads the heart. If you think you know what God knows, you are exalting yourself. Every plant which God plants bears good fruit. St. Paul told the Corinthians Church to judge the saints inside the Church (1 Corinthians 5-6). A man who is in a fornicating relationship was immediately excommunicated and turned over to Satan for the destruction of the flesh. Paul taught that a little “leaven, leavens the whole lump” therefore to purge out the evil person from among the fellowship of the saints. Somehow, there is a judging authority that is invested in the Church that must be exercised, not just for the well-doing of the Church, but for it’s very life and state in salvation. That is true. But that is not what you are doing. You are impugning all Catholics carte blanche. Something that any Church historian recognizes is that the methods of ministry in Rome back in the 200?s and 300?s onto the 7th century were much much different than today. The Church did not have an open door policy for anyone and everybody. It still doesn’t. Protestants do that. If you were among the faithful, you were examined to see if you lived in the commands of Christ. If you were not living in the commands of Christ, you were brought under discipline, and eventually excommunicated, and then only restored after a very rigorous and long road of penitential discipline. Perhaps. I don’t believe it though. The Catholic Church, from all I’ve read, has always been thoroughly reasonable. You could not just be a “christian” and on with your life. The Church was a strict order back in the day, and has become very lax in it’s discipline and has employed very simple ways of penance that allows many heard-hearted slaves of sin to be absolved from sin. Damned if you do and damned if you don’t. It doesn’t matter whether the Church issues discipline or not. Someone will find something to complain about. As for me, I believe the Church is doing just fine in its methods. If you read the accounts of the early church and it’s fathers, you will see there were many discussions about penitential discipline. I am not the only one who wants to judge the outside cover of the book, your own fathers were very excellent (and rightly so) to do so. There’s a big difference. You have no authority to judge anyone in the Church. They do. And because they do, God has given many of them the charism of reading the heart. Read about Padre Pio. Fourthly, you are not understanding my argument in respect to the disciples’ understanding of Matthew 16. According to you, Jesus’ statement “You are Peter, and on this Rock I will build my Church and the gates of hell will not prevail against it. And I will give you the keys to the kingdom of heaven and whatever you bind on earth shall be bound in heaven” does not necessarily have to be understood by the apostles in their life, is that right or wrong? Wrong. It did not need to be understood when it was spoken. But it was definitely understood by the time of the Pentecost, where the Holy Spirit revealed to them all things. It seems you implied this. However, it is very clear that the early church did not understand this text to be the foundation text which founded the dynastic petrine papacy. It is very clear that the Church did understand it and exercised it. Read Augustine, St. John Chrysostom, Tertullian, and others who cite this text and give another meaning to them! I have read them many times. And they don’t give another meaning to them. You are simply passing over this tremendous whole in the argument for a Christic establishment of the Papacy. St. John Chrysostom was a Bishop, and he also brought many many people through the process of the catechumenate, the course of baptism, and the laying on of hands. St. John Chrysostom himself went through much training in his life and was a professional catechist. And he does not know that Matthew 16 is the famous foundation for the construction of the very Church that he had been bringing people into for years? You are confusing issues. As I told you before, the Fathers speak unanimously in the documents of the Ecumenical Councils. Outside the councils, the Fathers are not unanimous on any doctrine. Tertullian himself was a scholar and studied in Rome. If he was a catechist (there is no doubt he was catechized), he was unaware of such a supposed famous and unanimous understanding of Matthew 16 carrying the foundation for the very singular and unique founding of the dynastic papacy. Something so foundational and essential to the life of the Church passed right over the head of Tertullian and many of the people who discipled him and whom he associated with. It is from Tertuliian that the Orthodox, Catholics, and Anglicans get their support to deny Sola-Scriptura and rely on tradition. And yet Tertullian is under no influence of a papal tradition that was unanimously understood in the 1 and 2nd century. None of them are infallible. But the Church is infallible. This would be like being a heart surgeon and not being aware that blood is pumped from it. It gets me very puzzled how Catholics can overlook such a huge whole in their arguments just from the life of Tertullian himself and his ignorance to the tradition of a papacy, or a roman succession as the singular means of God to build the Church. This would be like being a lawyer and not understanding the concept of law. You keep mixing issues. The Fathers speak unanimously in the documents of the Ecumenical Councils. Outside the Councils, there are very few doctrines where we can legitimately say that the Fathers are unanimous. There are many things which are absolutely true from the beginning for which we have only found a few Early Fathers teaching. There are many reasons this is so. For one thing, we don’t have all of their writings. For another, we have no reason to believe they were compelled to write about everything in Christianity. You are wrong. The Papacy was established by Jesus Christ and you are not understanding either the Scriptures nor the Church Fathers. Then you have not understood the Scriptures concerning Mary. Scripture says that God’s will should be done on earth as it is in heaven. 26 And in the sixth month the angel Gabriel was sent from God unto a city of Galilee, named Nazareth,27 To a virgin espoused to a man whose name was Joseph, of the house of David; and the virgin’s name was Mary.28 And the angel came in unto her, and said, Hail, thou that art highly favoured, the Lord is with thee: blessed art thou among women. 1. an angel is a messenger of God. That is what the word, angel, means. 2. this angel, Gabriel, is one of the four angels that stands before the throne of God. 1. God sent this angel to Mary. 2. Since this angel is a messenger of God’s, God sent Him to deliver a message. 3. Therefore, the angel was not speaking on his own, but was communicating God’s message to Mary. 4. If we skip down to verse 28, we see that this was a message of praise (i.e. blessed art thou). 5. Therefore God praised Mary through His Angel. That is great praise indeed. Do you know of any man whose praise is worth more than God’s? In other words, what do you value more highly, the praise of man or the praise of God? But, there’s more. God sent the Angel to do His Will. What is His Will. Obviously, God sent the Angel to deliver a message of praise. Therefore it is God’s will that the Angels praise Mary. 41 And it came to pass, that, when Elisabeth heard the salutation of Mary, the babe leaped in her womb; and Elisabeth was filled with the Holy Ghost: 42 And she spake out with a loud voice, and said, Blessed art thou among women, and blessed is the fruit of thy womb. Should we break this down? 1. The Holy Spirit is God the Third Person of the Holy Trinity. 2. Therefore, God inspired Elisabeth to praise Mary. 3. This praise is inscribed in the Word of God for all generations. 4. Since Elisabeth is a member of the human race, then it is safe to conclude that God wills that men praise Mary. 5. And we find, again, that God praised Mary through His Saint. Saint Elisabeth praised Mary when she was inspired by the Holy Spirit to do so. That means that it is the Holy Spirit’s praise which she passed on. That is why Scripture is called the Word of God. Because it is inspired by the Holy Spirit. Need we say more? Let’s do it anyway. 1. The word “Lord” is here mentioned two times. 2. In the second instance, it is an obvious reference to God. “Blessed is she who believes that the LORD would fulfill His promises.” That is an obvious reference to God. 3. Therefore, then, what could she possibly have meant when she said, “mother of my LORD”? 4. Since she was inspired by the Holy Spirit to utter these words, she must have meant what is most obvious. Is Jesus, God? Yes. Therefore, the words she uttered could also be translated, “mother of my GOD”. 5. So, God explicitly teaches us, in His Word, that Mary is the Mother of God. Is there any higher praise than that? And there’s still more. God gave Mary to us as our mother. Protestants frequently question why the Catholic Church teaches that Mary is our Mother. Here’s what I tell them. So, let us go to the spirit of the text in question. 26 When Jesus therefore saw his mother, and the disciple standing by, whom he loved, he saith unto his mother, Woman, behold thy son! 27 Then saith he to the disciple, Behold thy mother! And from that hour that disciple took her unto his own home. 28 After this, Jesus knowing that all things were now accomplished, that the scripture might be fulfilled, saith, I thirst. Catholics are taught to read Scripture as though God was speaking to us. Now, are you a beloved disciple of Christ? To put it differently, are you a disciple whom Jesus loves? Catholics would answer, “Yes” to that question and therefore accept Jesus command to take Mary as our mother and bring her into our home (i.e. heart). Then, you need to be aware of other verses in Scripture. Do you consider yourself someone who keeps the Commandments of God and the testimony of Jesus? If so, then you are seed or a child of the Woman. That Woman is Mary. And therefore, Scripture says that all who fight the good fight on behalf of God in Christ, are children of Mary. He also was human. And in some things, he erred. Notice how you understand “church” to be strictly the Papacy excercising it’s infallibility. In other words, you understand “church” in matthew 16 when Jesus said “I will build my church” as not referring to the whole community of disciples (human beings) but rather the institutional office (inanimate) of the Papacy (distinct from the human being who resides in it). Try to find another reference in Scripture where this meaning is given. Also, if you condemn Anglicans for preaching a false gospel, then you must also condemn all others who are preaching a false gospel. In other words, as Vatican II said that we are separated brethren and that we are to come into the “Fullness” of the faith is completely rejected by you. Scott Hahn, leading Catholic apologist, does not even take this sectarian view as you do. “Notice how you understand ‘church’ to be strictly the Papacy exercising its infallibility. De Maria understands no such thing, nor can one logically come to such a conclusion from reading what she wrote. Perhaps your problem is assuming that she is saying what you wish she were saying because that is so much easier to reject than what she actually said. Or perhaps it is just poor reading comprehension. You never asked me how I understand “church”, nor did my understanding of the word, “church” ever come up in this discussion. I understand “church” the way the Catholic Church teaches. Depending upon the context of its use, the word “church” can be the authoritative Church or it can be the “body of believers”. You exhibit the typical Protestant either/or attitude. In Matt 16:18, Christ means all of the above. 2. Jesus also established the hierarchy of the Church. With St. Peter being the foundational member upon whom the other officials, the other Apostles, would rely. 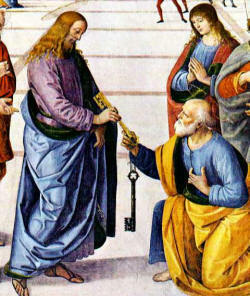 3, And Jesus established the office of the Papacy when He gave St. Peter the keys and the authority to bind and loose. The fullness of the meaning of the word, church, is exhibited in those verses. Also, if you condemn Anglicans for preaching a false gospel, then you must also condemn all others who are preaching a false gospel. Anyone who preaches a false gospel, condemns himself. In other words, as Vatican II said that we are separated brethren and that we are to come into the “Fullness” of the faith is completely rejected by you. On the contrary, the reason I show the separated brethren their error is so that they may repent of their error and turn to the Church. Scott Hahn, leading Catholic apologist, does not even take this sectarian view as you do. Scott Hahn is an awesome apologist. Tell him that you are happy to remain outside the Catholic Church and see what he says to you. If I remember correctly, he roundly ridiculed a priest who, when he was seeking to enter the Catholic Church, told him that he should be the best Protestant he could be. The episode is well documented. Apparently, he didn’t realize how much consternation he had caused the priest. Because the recording which contained Scott Hahn’s statement is the most popular Catholic recording ever produced. So when Jesus “the gates of hell will not prevail against it”, you mean to understand this as the whole community of human disciples in communion with St. Peter? If not, what is it that cannot be overcome? Simply the doctrine? The people? The institution? do you see? When “church” is used in the NT (I would look at a concordance) it is almost always referring to the community of disciples. When Jesus sent out the 12, he said “Go and make disciples of all nations” (Matthew 28). This is parallel with “I will build my church”. In other words, Christ’s construction of the Church is in fact the creation of disciples through the apostolic ministry. There really is no case for limiting “Church” to be only that of it’s authoritative “institution” where the human itself is not included. Whether this is what you are saying or not is irrelevant even at this point. I am just curious as to how we can understand “Church” in Matthew 16 as anything other than the community of disciples (whether universal or local). Bill, if I was your son and I was trying to seek the truth and I began to debate with you about something, would you respond in loving, caring, gentleness, and humility “You must have bad reading comprehension”? Why insult me? I am performing to the best of my ability to throw out my barriers in order to have them put down. If this looks like deterministic argumentation, please allow yourself not to take it this way. As an anglo-Catholic, I am not very comfortable at the moment being this. It is my great desire to become Catholic. I might add, if you already do not know, I was born and raised Catholic. The very thing that led me away from Catholicisim in the first place is the very same thing that now keeps me away, and that it simply has very weak mechanisms (in my perspective) in sharing the truth of the gospel of Jesus Christ. A 7 minute homily is really miniature compared to old early Catholic fathers such as St. John Chrysostom. Back in the day, the Bishops were concerned that the people knew their faith. Nowadays, you get a lot of Catholics rising up and saying “Hell!?!? That’s not the God I serve. The God I serve is loving”!! or “The bible says not to judge” or “Everyone has a right to believe whatever they want to believe”. There is a huge need for evangelization. It is my prayer that this will eventually ease my submission. 1. Yes. All who remain in communion with the Pope will be saved. 2. But I know what you are getting at and we will discuss it when you mention it expressly. “If not” is not applicable. A. The Church is still here and still preaching the Gospel. B. All who remain in union with the Church will be saved. C. Because all who remain in union with the Church follow the Church’s infallible teachings. Protestants love concordances. But I note that few of them actually speak the language they are looking up. I’d rather go by the actual interpretation of someone who knows the nuances of the language. it is almost always referring to the community of disciples. 1. “Almost” being the key word there. When Jesus sent out the 12, he said “Go and make disciples of all nations” (Matthew 28). This is parallel with “I will build my church”. In other words, Christ’s construction of the Church is in fact the creation of disciples through the apostolic ministry. There really is no case for limiting “Church” to be only that of it’s authoritative “institution” where the human itself is not included. Who limited Church to that meaning? You are insinuating that I did, but I direct you back to the message where I told you the Catholic understanding. Whether this is what you are saying or not is irrelevant even at this point. You can’t be serious? What I’m saying is irrelevant? I am just curious as to how we can understand “Church” in Matthew 16 as anything other than the community of disciples (whether universal or local). Bill, if I was your son and I was trying to seek the truth and I began to debate with you about something, would you respond in loving, caring, gentleness, and humility “You must have bad reading comprehension”? Why insult me? He’s not insulting you. He is saying precisely what I understood of your message. Your are ignoring what I said and making a straw man which you can knock down. Straw man arguments are false arguments. I am performing to the best of my ability to throw out my barriers in order to have them put down. If this looks like deterministic argumentation, please allow yourself not to take it this way. Why should he pretend that you are doing anything else? It is obvious what you are doing. As an anglo-Catholic, I am not very comfortable at the moment being this. It is my great desire to become Catholic. I might add, if you already do not know, I was born and raised Catholic. The very thing that led me away from Catholicisim in the first place is the very same thing that now keeps me away, and that it simply has very weak mechanisms (in my perspective) in sharing the truth of the gospel of Jesus Christ. Look around. Haven’t you noticed that this is the only Church that has evangelized the world. No other Christian entity can boast of that fact. A 7 minute homily is really miniature compared to old early Catholic fathers such as St. John Chrysostom. Cultures change. The Eucharist is most important. Multiplication of words is not. Back in the day, the Bishops were concerned that the people knew their faith. Nowadays, you get a lot of Catholics rising up and saying “Hell!?!? That’s not the God I serve. The God I serve is loving”!! or “The bible says not to judge” or “Everyone has a right to believe whatever they want to believe”. 1. You have a lot of Protestants saying that also. 2. The Church still teaches the truth. It is not the Church’s fault if people ignore or reject her teaching. 3. You have also rejected part of the Church’s teaching. So how are you better than they? I’ll pray for that intention also. Thanks for the support. Just want to mention that I’m a guy who loves Mary. The handle “De Maria” is Spanish for “belongs to Mary”. And it also reminds me of the Latin saying, “De Maria nunquam satis” , “One never hears enough about Mary”. Next post: 2 Million Miles with Delta! Yikes!